Laura from Titchy Threads just hosted a sew along with one of her upcoming patterns, the Small Fry Skinny Jeans on her blog Craftstorming, I have been on the look out for a cool pattern for skinny jeans for Eloise and I HAVE FOUND IT!! These are so cute and the fit is great (this pair are a little big because the free pattern was the 2T and Eloise is not quite a 2T yet). They have adjustable elastic so she can wear them now and they'll grow with her until she IS a 2T. The pattern pieces are professionally drafted and they line up beautifully. The instructions are very easy to understand and follow. No detail has been left out. The pattern includes front and back patch pockets, half fly, back yoke and adjustable waistband (using button-hole elastic). Laura has thought of everything and the end result is quite polished. I decided to use stash fabric to try the pattern out and remembered I had this super bright (visible from the moon) orange drill fabric that I bought to make shorts for Seth. I decided to go all out with hot pink patch pockets. I used a pretty pink/orange butterfly fabric for the pocket linings and the waistband lining and appliqued one of the butterflies onto the back pocket. Eloise loved them and tried to put them on herself as soon as she saw them. Please excuse the scruffy hair and no shoes in the shots. Eloise had just woken up from her nap. Thanks for the awesome pattern Laura, I can't wait to sew up my next pair. I'll be eagerly awaiting the pattern release. I'm thinking of using a modified version of this pattern for my entry in an upcoming blog series. for her Challenge: Project $0 2013. Thanks for stopping by and as always, I love to read comments so please let me know what you think. I'm just in love with this version! great job.The contrasting fabrics look amazing, like it. I'm happy to hear you like the pattern so much. 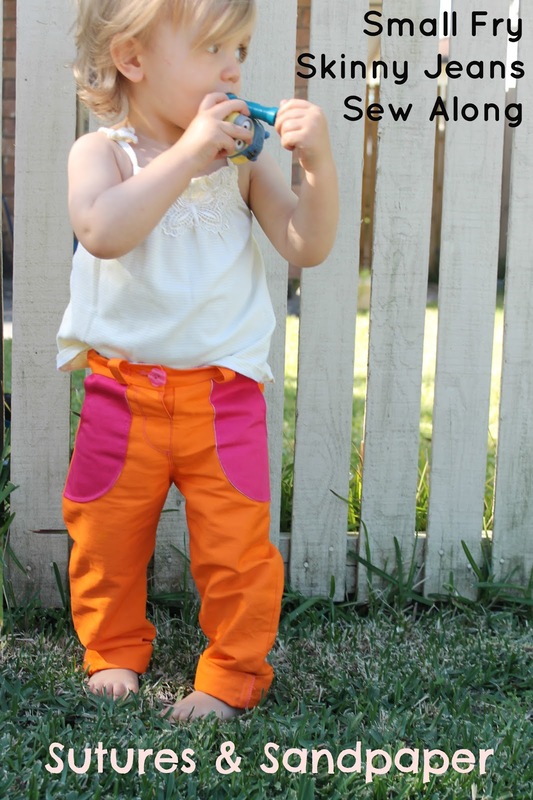 I love the bright orange and pink combination - your little girl looks very cute in them. These are so cool! I LOVE how bright they are!